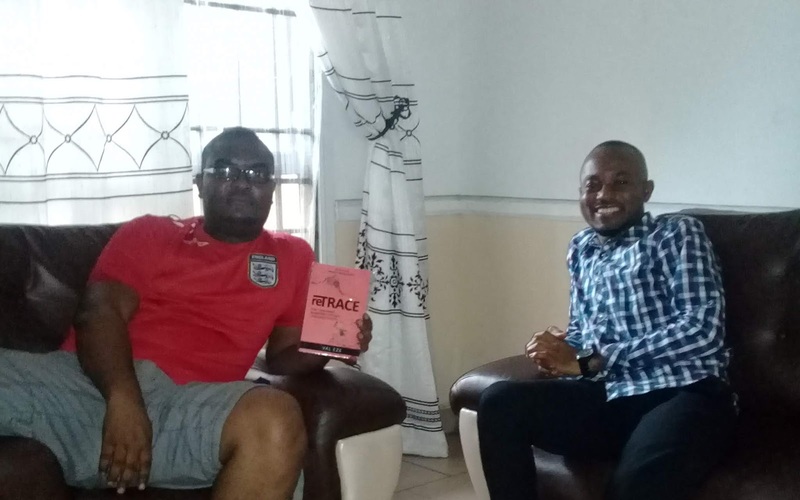 RETRACE is a book you need to read. It's now up for orders. PLUS DELIVERY TO ANY LOCATION IN NIGERIA. 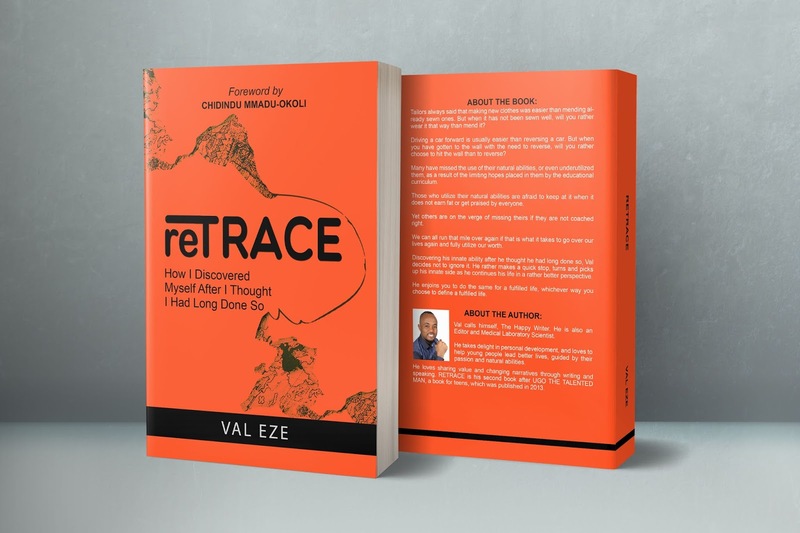 If you reside outside Nigeria, please order on Amazon by logging onto www.amazon.com and typing 'RETRACE VAL EZE GIFT' into the search box. IT'S YOUR CHOICE NOW. CHEERS!!! Before you stop reading, read the last line. Thinking of launching a book? Well, that wasn't the mistake I made. I offered the book to persons whom I wanted to get the book. But not all wanted to get it. Some may later drink the waters of the book. Some may never thirst nor hunger. Let me give you this revelation! Down here, what we call book launch is better called fund-raise. We launch to get people to donate, not to get the book in the hands of many in a bid to create an effect. And when the big donors don't show up, we are devastated. When they show up, but make pledges, we get frustrated calling to follow up and not getting the money we crave. But remember that some people write books and give them out for free. People write for various reasons. And when I told someone, just before my 'book launch' in November - (😀 you're smiling. Yes, because I said DON'T LAUNCH earlier?). 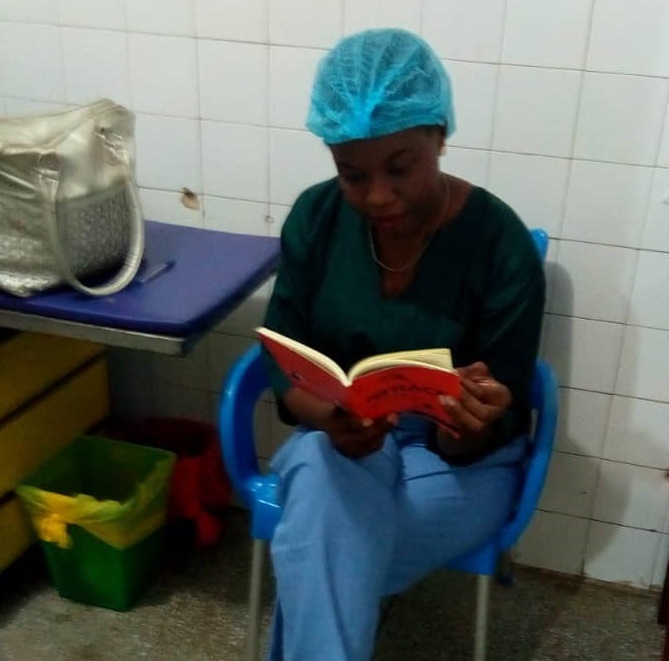 So when I told someone that at this point, I don't crazily wish for the donations and pledges but just a purchase of the book, it was a surprise, even to me. My heart wanted that at the time; and I voiced it. And then I accepted it. Maybe in future, I might throw a bang for a book launch and raise millions. The one who purchases is the one who will value it. Though not all. The one who offers huge sums as donations may be beclouded by the feeling of having done you a great favour by helping you cover costs. He may not value it. May! Some may actually give from their hearts. The one who gets it for free may have a feeling of having lost nothing. He too may not value it, because there was no commitment. Except for those to whom you may be doing an honour or respect by taking the book to them and telling them you've written a book, you may consider avoiding the launch. 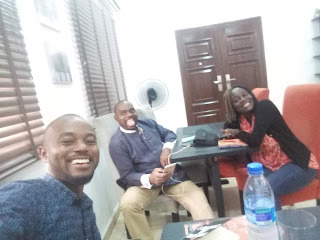 If you have the kind of connection that will fetch you millions after launch...I mean cash-in-hand...by all means, do your book launch and hammer. One or two senior donations can cover your costs and do good to humanity. But if you don't have big-money co-nn-ec-tions, please please please, take care. Others may have their critiques of this take of mine. But that's what I think works at the time we are in. Oya o, the critiques of this method. And we could even write a book on them and sell to you to read yours among other critiques. Dear prospective author, don't do this. Don't launch in a singular bid to raise funds. Except for the purpose of charity or for helping those who cannot afford it to get copies for free or at a subsidized rate. Your story will not end with the one book you've written. Think of the ripple effect your book should create, rather than just the bucks you'd raise. That money is good shelter. It'll fund your business and growth. But don't make it your bustop. Think of narratives that appeal to hearts and change minds to smile to the world with greatness and yearnings for the blessedness that you dish out. Think Book Marketing; Think Book Sales. Someone just bought my book - #Retrace; her comment when she read through one chapter still resounds in my head as I write this. I'm glad at the narratives we are creating as Nigerian-African writers. I'll be helping as many as reach out to me to help them win more than me and fail less than me in book writing and marketing. I'll leave you to imagine. 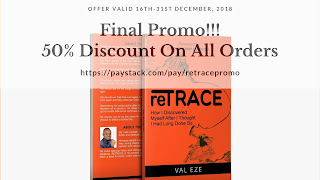 I'm still giving out the #Retrace ebook for just N1,000 till 31st December, 2018. I've constantly struggled with thoughts of doing a Christmas Promo for those who wish to get copies of my book - #Retrace. The thought of it has lingered, and I was almost not going to do that this year for cogent reasons. However, I've let loose for the last days of 2018. On the 31st of December, 2018, it'll be exactly one year since #Retrace got conceived in my mind and set to sail and grace the pages of this piece. It is on the back of that premise that this offer rides. 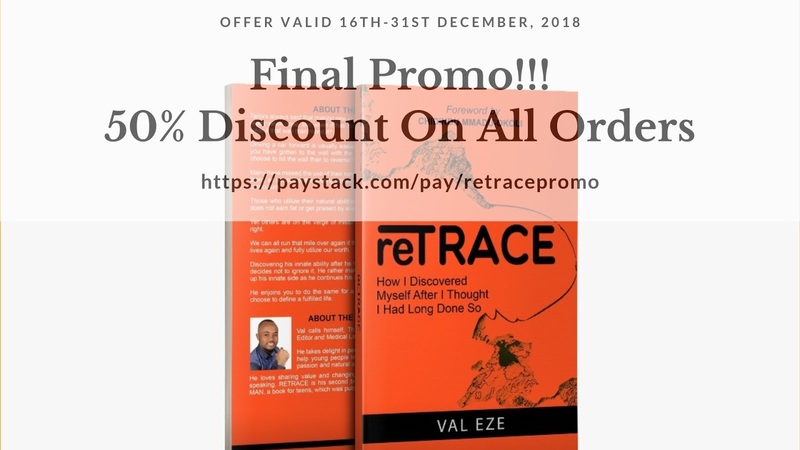 From 16th - 31st December, 2018, you can get the EBook at a whole 50% discount. Yes, I'm giving it out at 50% off the price with a sense of offering. Don't miss this and complain tomorrow. Just order it now. I'll bring it down once we cross over to 2019. YOU DO NOT NEED TO DO ANY OTHER THING TO GET YOUR COPY OF THE BOOK. IT WILL BE DELIVERED TO YOU ONCE PAYMENT IS MADE. As the son of one who marks WAEC and NECO exam scripts, I have been a part of that path. I have also worked as a NECO adhoc results collation officer in 2013. I learnt how scripts are marked. Sometimes, what earns you the marks are the salient points, not the long grammar you thought you wrote right (which can sometimes be wrong). Hit the point and you score. Ok, stay with me while I make a point. If you've ever written a Mathematics Exam, you will agree with me that your score doesn't only depend on the final answer, but largely on the steps of the workings. Still read down and understand what I mean. You'll never really understand what it means to read a book until you have read one and picked a life-changing point. Never read a book hoping to get value from every single word in it. Not all words will hit you. Not even all chapters will. That's what authors don't tell you. Well, that's the fact. 1. Clinch your right hand to make a fist. 2. Imagine you have a butterfly in your hand. You are at liberty to crush it or let it stay alive. The choice is yours. Your life is in your own hands. I have offered #Retrace to you. Get it or let it sail away to the other side of the river. The water lily beckons for an embrace from that floating piece. The choice is all yours to make or let be. But you can do otherwise. Need a copy of #Retrace? Fire a message to me now. I will catch it. Then send your name, phone number, email address, and full contact address(for delivery) to +2347036223072. I'm not sure what flashed through your mind when you read that heading up there. But I'd had a chat with someone, who told me how stressful her job was. One thing I told her was this: strive to gain as much experience as you can from the stress. Keep doing it with committment and you'll appreciate it later on. You may not be doing the 'best' thing you are 'capable' of doing today. You may actually be doing something good now that gives you money, power, and the 'conviction' that you're doing well. That's good. Very good actually. If you walked in your mother's womb, no one would have rejoiced the first time you tried to toddle. 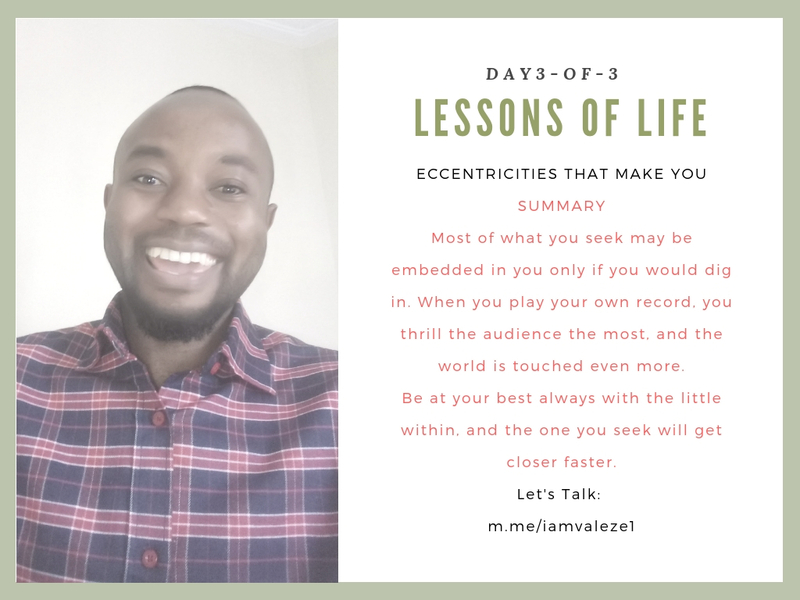 Every growth from any level brings joy and fulfilment that comes with actualizing what you've been originally cut out for. Even as you work to make ends meet, delve into the reality of your own self and build on it even in the most little way, because the things you enjoy now and the comfort you have may not live as long as you. Only your innate being will. That is what you'll never lose even if planet earth stops rotating around its axis. It's not a bad wish. It's the reality that evokes mind-shifting thoughts. And time will tell. Never ignore your DNA no matter what else you do. Please, never! If you've got a copy of #Retrace, refer to chapters 25 & 26 and reason along this line. WISH TO GET A COPY? CLICK HERE TO GET ONE. As of today's collation, 91% of #Retrace orders have been confirmed delivered across Nigeria. 1.5% are yet to be dispatched. Have you ordered yours to learn about the decision I made that makes me happy even when I work myself out? Well, what do you think about joining a media team someday? Growth is imminent as well as paramount. The week is almost completely eaten up. 2019 beckons. I'll send you a very short message this evening before you go to bed. If you're a writer of any sort, watch my next broadcast. I'll share a simple tip that helps me. Lydia Maduh is a nurse. Guess what she's waiting for as she glances her copy of #Retrace. All that man said only presented itself in one word to me. I couldn't exactly pin down what the word was, but I knew it was something that a lot of young people were taking for granted. When I began to read Retrace, I found that word. I found it in plural form—opportunities. I caught the word: the word that wraps up all the things he said to me. I cried a little. And I laughed too. By the time I got to the last page, there came an adjective to qualify it as limitless opportunities. Val Eze has his way with words. Having sat in the same lecture hall for five years with the first author in a class of over one hundred and thirty students, he is one of those, whose words and actions align. 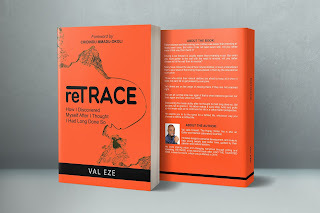 With Retrace, Val walks a path where many see as impossible to pass through. He doesn't do so as a person of authority; he does as his story portrays—of a multi-talented, whose clarity about life comes from his consistency in fully applying himself in every situation. This is the real story of a life I know: his ability to tread paths until the grasses give way and the route becomes clear to those who desire to tread this path. This is still his present nature. Today, Val creates limitless opportunities with Retrace. It is a call to originality, immersion and overflow. The narrative turns us into the within, undresses our limiting beliefs, and presents us face-to-face with the truth that we have been running away from. Have I even talked about how he talked about fear? Amazing! Go ahead and see for yourself. Another thing to note is the power of building networks across. Val opens our eyes to the simple analogy of how we can build and collaborate with our own cheerleaders whilst seeking to bind with those at the top. Judging from my own personal life, Retrace provides that simple process of building a ladder that aids the climb to your dreams. You've just gotten a copy! I am proud of you! You are damn lucky! No, scratch that! You are rich: richer than all others who only have money. Now, dig deep without wasting a moment. Turn the pages over and again. His words are simple. He speaks in a language that only humble minds can understand. When you find the words that hit you, do me a favour! Share that word with the world! Tell them you are on a retrace. Ask them to do exactly what you have done to stay on track—that is, to get a copy too. Retrace is the kind of book you read in your room, in the bus, at the restaurant and when you take a stage. I hope you have the same feeling I had until I had read the last page of this book. Have a good time reading. Tailors always said that making new clothes was easier than mending already sewn ones. But when it has not been sewn well, will you rather wear it that way than mend it? Driving a car forward is usually easier than reversing a car. But when you have gotten to the wall with the need to reverse, will you rather choose to hit the wall than to reverse? Many have missed the use of their natural abilities as a result of the limiting hopes placed in them by the educational curriculum. Those who utilize their natural abilities are afraid to keep at it when it does not earn fat or get praised by everyone. Yet others are on the verge of missing theirs if they are not coached right. We can all run that mile over again if that is what it takes to go over our lives again and fully utilize our worth. RETRACE is set to bring to you, personal experiences of the author, and of persons whose lives inspired the writing of this piece. Please note that for the purpose of anonymity, some names—except that of the author and those of persons who have rightly given consent—found in this book do not represent real persons, even though the experiences expressed therein represent personal experiences. My story may be different from yours, but as you read, dip yourself into the intent of this book and get enriched by its demands of you, which mirror the everyday life of you and many others out there, whose lives need to be retraced on the map of productive living. This book has been sectioned into four to help you figure out where you have derailed, note your short falls, map corrective steps by living your entitlements, rather than just assuming rights of possession of them and waiting to be offered same. The last section tells you to take action. If you do everything and fail to take action, then you have missed the whole mark. RETRACE is meant to add value to your life, not number to your library. Summarily, always strive to get better than your current self. Read my story, but apply the lessons to fit into your own unique life. DO NOT LOOK AT YOUR WRIST WATCH UNTIL YOU HAVE FINISHED READING. It might interest you to know that the reason I come up here to address some issues is because people engage me and ask questions when I send broadcasts. While I will not disclose the identity of anyone who asks, I’ll address their concerns generally because their challenges represent the concerns of many. It shows that some other persons could have similar challenges, but remain mute for some reasons. Someone asks about self-discovery – how one can achieve this amidst illusion. Well, there is no hard rule. Just be attentive to yourself and your daily yearnings. It’s not out of this world. It’s in you and your daily dealings. Your past holds a lot of it too. What are those things that make people see you differently? What are those things you do and people just see you as weird and you just wonder why they have different views of it? Perhaps dem say you too talk. Or dem say you too dey overdress. Or say you too waka. Or dem say you too dey speak grammar. Or you too like children. Or dem say you too dey stay around women. Or even say you too dey do formality. What makes people snub you? What are those things you do with ease, and you think that everyone should equally be able to do them? You wonder why they can’t. Do they think you are crazy? But really, you think you are somewhat psychic? Find your strength in them. 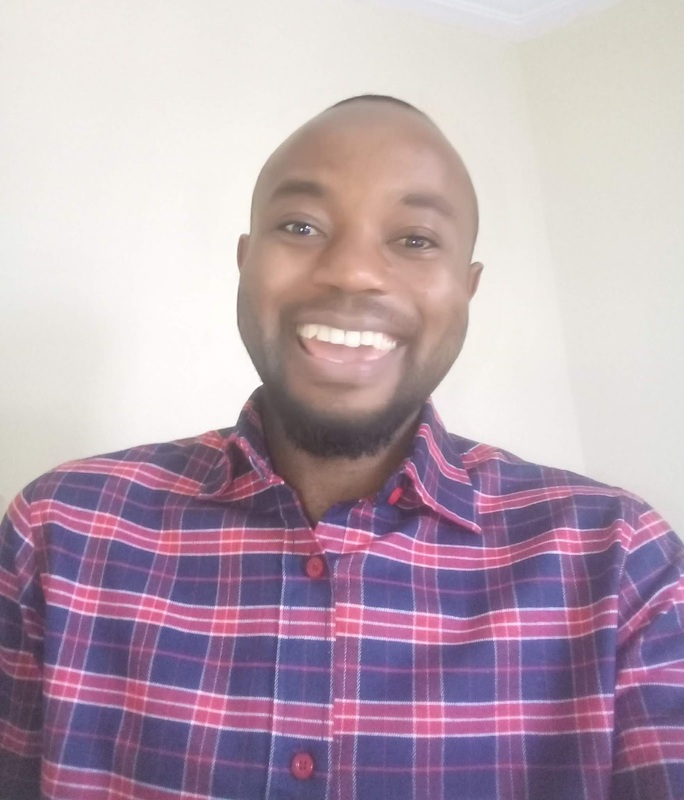 For me, apart from Mr Meticulous, I was also called ‘Detail Man.’ I can give you explanations that will answer even the questions you are yet to ask; just to save you the stress. That’s not a routine anyway. It may not even happen in your own lifetime. But it goes to show how what surrounds you or what people see in you becomes your strong point if you care to be attentive. This might be your problem: you want to do what everyone wants. You seek accolades from everyone. Even Christ did not come close to achieving that. So you think you can? Everyone will not like what you do. Not everyone will listen to what you have to say. It’s often been said that if you want to do what everyone likes, then you’ve got to sell ice cream. I’m sure you know that not everyone likes ice cream. At the Six O’clock position of your wrist watch, what do you have there? NOW LOOK AT YOUR WRIST WATCH. If you did this sincerely and got it correct, thumbs up. If you got in wrong, don’t worry. This is meant to show you how people have something on them and in their hands, but fail to recognize it and take full advantage of it. They keep struggling for what is farther away. Sadly, many don’t ever get satisfied. Some even die in the process. It’s all the struggles of man. Most of what you may seek may be embedded in you only if you would dig in. When you play your own record, you thrill the audience the most, and the world is touched even more. Be at your best always with the little within, and the one you seek will get closer faster. Ehen, about my friend that says he wants to do what I do; I want to let you know that I also wish to be like someone or some persons. That’s life and that’s how it works. I know you might have people you look up to. It’s not enough to call them your role models. It’s not enough to take selfies with them when you will end up taking another selfie with them one year later, still maintaining the position you found yourself when you last met them. Growth is pertinent. I have role models, but I may never be like them all. Yes, it’s the fact. Take what the person is modelling you on and focus on fitting it into your own life to produce, not his results, but your own unique results. No doubt your results may be similar, but know your lane. Never follow someone to the point of living that person’s life, except you’re making a ‘genuine’ sacrifice. You could do better. That is why you must have to discover yourself and what you stand for. Failure to do that places you on the radar of guesswork all your life. In chapter 29 of my book, I used a typical example to explain how we should see role models: The Thai boys and their coach, who were trapped in a cave in June 2018. They were assigned scuba divers as emergency role models. They had to learn a bit of scuba diving to be safely guided out of the flooded cave before the rain is expected to rumble. They were not trained scuba divers and they may never become scuba divers after their rescue. But at that point, that was what they needed to learn to make attain a milestone—to stay alive. Sadly, an experienced diver died in the mission, but the boys and their coach all came out alive. You may never become like your role model, but you have a lesson to pick and work on, based on your own peculiar objectives. Well, you might have a contrary opinion theoretically, but when you get to the field of play, reality will stare you in the face. Truth is: many people who claim to be ardent followers of their role models are rather hypnotized to think that they can only do less. They don’t even know this due to the ‘hypno’. Yes, I know about Robert Greene’s First Law of Power. But your role model is at least not your master. So, that doesn’t fit in. Linking it to yesterday’s lesson, I urge you to pick your lessons and invest all you can to lock them into your life. It will require you to take that hard decision that usually elicits fear. Chapter 20 of my book puts it straight. Thinking of venturing and being consistent, the fear of sustainability often surfaces even before you start. Start nonetheless, but make a firm resolve to obey the rule of continuous learning and consistency. Do this by accepting to dare the odds each time you feel like quitting. It may not be so easy, but if you don’t dare, then you may yet be starting another failed-from-start venture. That’s if you ever started one before. Lastly, forget about sleep. That stuff is a waste of time. I know that someone will smile to this. But wait! Before you come for my fine head, still read down. Over the years I have adapted to less sleep, that’s putting it literally. It may be entirely unhealthy and difficult at first, but people who do stuff will understand what I mean. At some point, you don’t necessarily decide to, but simply find yourself sleeping less. Actually, it goes farther than just sleeping less. When you close from work, others close from work too, but not all of them close work. Note the difference. To my friend, don’t just be like your role models. Admire them enough to make you learn and act exceptionally. We could ply the same route at some point, yet land at different destinations or at different points in the same destination. You can do better. The scuba diver died, but all boys and coach who looked up to him were saved. And life has since gone on. Was that fair enough? Help me ask Fate. We talk about eccentricities that make you. I just want to change your mindset and make you better through my writing.